More than 24,000 miles of local roads have been identified as needing essential maintenance within the next year – a distance that would almost stretch the whole way around the world. The AIA report says more than 24,000 miles of local roads need essential maintenance within the next year. 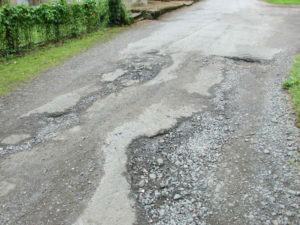 According to the newly published Annual Local Authority Road Maintenance (ALARM) survey for 2018 from the Asphalt Industry Alliance (AIA), one in five of our local roads are now classed as structurally poor – with less than five years’ life remaining – compared with one in six reported last year. The research also found that English and Welsh local authorities now report a shortfall in roads funding totalling nearly £556m a year – equivalent to £3.3m per authority. According to the findings, it would now take 14 years to get local roads back into a reasonable steady state, provided adequate funds and resources were available. Rick Green, chairman of the AIA, said: “Local roads are a vital asset, worth in the region of £400bn, and they support all aspects of our daily work and home lives. But funding for their adequate maintenance has fallen short for so many years that further deterioration is inevitable. Responding to the findings, both the RAC and the Local Government Association called for funds from existing fuel duty revenue to be reinvested in local roads.